The Hensler Bone Press (HBP) is a patented device which maximizes the collection and separation of autologous bone. 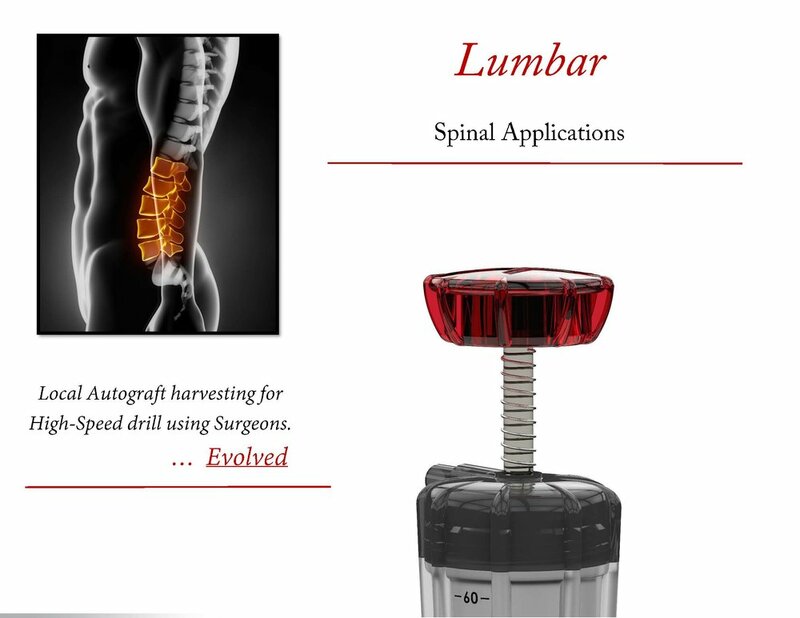 Our product quickly and efficiently separates bone from fluid during surgery, which yields a semi-dry graft-ready material for fusion procedures. The press head has been highly engineered for steady and equal pressure with each use , as well as tested to maximize the proficient separation of autologous bone from blood through its multiple proprietary functional design. The HBP employs a proven and patented 2-step method, as to allow little to no interruption of the case. This innovative process of simultaneous bone collection and separation has been simplified to allow the surgeon and/or assist to maintain efforts on the surgery, while producing a favorable and moldable graft for use as the surgeon desires. Collection of the autologous bone from surgical site. Press mechanism combined with surgical grade mesh to separate autologous bone from fluid. After the press has been manually deployed it its down position, simply tilt the container to suction away fluid leaving only the semi-dry autologous graft. Blood can be salvaged as well with use of the cell saver. The handling properties of the graft is optimized, for easy placement into interbody implants, packing around hardware in the posterolateral gutters or simply to on-lay laterally for in-situ fusion applications. Given the texture and graft characteristics, the funnel applications for pre-interbody placement or newer generation in-situ interbody systems is flawless and does not get stuck in the funnel when deployment of the graft is engaged. Incorporating the HBP graft with other bone alternatives is equally effective. Although the demand for as much synthetic, allograft, and/or biologics will be less using this target graft source, the addition of the patients own osteoinductive and osteoconductive cells will add those critical elements into the scaffolding, bolstering the fusion mass required for the case. Mixing the bone milled bone to the HBP graft, is another proven technique, that seriously increases the amount of Autograft available, stacking the deck for the patient and their fusion. This device allows for simultaneous operations, as to not interrupt the flow of the case. After each transfer of the graft harvest is to be processed, the press operation takes place on the back table, as the collection resumes. The surgeons work will not be halted, the suction flow will not be clogged, and during the entirety of the case, this process can occur as many times as the case necessitates when drilling and collection is demanded. Easy to use and designed to be a valuable addition to the surgical case. 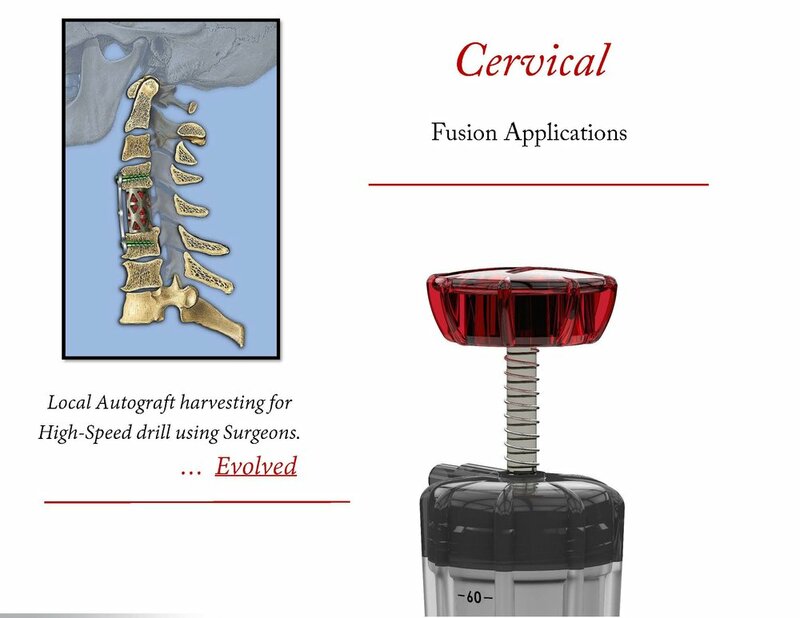 MOST importantly, designed to maximize your patient's own bone for their fusion, bringing about cost containment and patient benefit with each use. • (1) HBP proprietary Press Top. • (2) HBP 80cc containers, with patented ergonomic design. • (1) Polypropylene right angle tubing connector. ..... Seperately packaged, Custom tubing. (1) Custom suction tubing in 3' or 6' lengths. Virtually any field conducting a bone fusion case, whereby bone is collected and necessitates proficient separation will benefit from the Hensler Bone Press. Utilizing the 2 - Stage method and swapping out containers when full.